VATICAN CITY (CNS) — Condemning an economy that encourages speculation more than entrepreneurship, warning priests and religious that they share responsibility for the vocations crisis and telling young people they are right to be puzzled by nations that close their doors to people fleeing persecution, Pope Francis spent a busy day in Genoa. Besides being packed with pastoral appointments, the pope’s visit to the northern Italian port city May 27 also was emotional. He told workers in a struggling steel plant that it was from the Genoa port that his father and grandparents immigrated to Argentina. Pope Francis’ daylong visit began with an intense morning of answering questions: first, from workers and business owners gathered at the steel plant; then from priests and religious in the city’s cathedral; and, finally, from young people gathered at a Marian shrine overlooking the city and the sea. Starting his visit with the workers, business leaders and unemployed, Pope Francis told them that for those who are able to work, having a job increases dignity, bringing a way to support their family and contribute to society. For that reason, he said, government policies should not be so much about ensuring everyone gets a monthly check of some sort, but that everyone who can work can find a decent job. “It must be clear that the true objective to reach is not ‘an income for all,’ but ‘a job for all,'” he said. 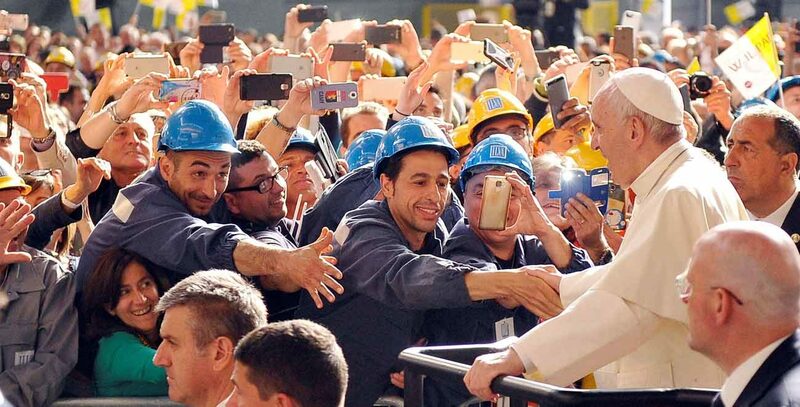 A business owner who uses his business for speculation “does not love his company (and) does not love his workers, but sees the company and the workers only as means to a profit.” the pope said. “Firing, closing (or) moving the company creates no problems for him,” because such a person is interested only in the money. Pope Francis also warned the workers and business leaders against the highly touted idea of “meritocracy” in the workplace and the economy. The idea, he said, takes a positive, “merit,” and “perverts it” by mistaking as merits the “gifts” of talent, education and being born to a family that is not poor. The obligation to do something also was on the pope’s mind when he moved to the cathedral for the meeting with bishops, priests and men and women religious. Asked about the dropping vocation rate, Pope Francis said one can’t ignore the impact on vocations of Catholics having smaller families than in the past. But, also, he said, priests and religious themselves must look at the kind of witness they give young people. To fulfill Jesus’ command to share the Gospel with others requires learning how to see them with “the eyes of the heart,” listening carefully and loving them, he said. To be Christians who make a difference, he said, young people must have the same qualities as Genoa native Christopher Columbus and the other explorers: the ability “to look beyond your own nose” and the courage to set off, not always accepting what other people say is “normal,” the pope told them. Is it normal, he asked, that so many refugees and migrants have such difficult lives when they finally reach a safe country? “Is it normal that the Mediterranean is becoming a cemetery” with refugees drowning?